Loving the webbed trees and you cant beat random rubble. One way around that is to have movement speeds not be so much of a given. In D&D for example, a LOT of folks and critters all have the same movement speed of "30'" or 6 squares/hexes. In my game, I am also using a number of movement speed modifiers (race, armor, class, feats, spells, auras, elevation, difficult terrain, etc.) so that in many circumstances it is very hard to eyeball or know the movement outcome. I do allow someone to modify their movement from standard to a charge if after starting the move it appears they will be coming up short (assuming the terrain permits the charge attack). That does let them close the gap, but also leaves them more vulnerable to other attacks. Characters know their current speed, other than impacts of terrain, so that is a fixed starting number (not as much dynamic speed calculations as the list above implies). Some players are really good at eyeballing stuff, others not so much. Also for me having some sort of grid gives me structure as well. We do keep a yardstick handy at all times, mainly for ranged attacks/spells and evaluating line of sight questions. Also makes for quicker determinations of range when shooting from or at an elevated spot, even more so when shooting from one elevated spot to another, diagonally across a courtyard of a Keep for example. I like a lot of the ideas if first paragraph. Fixed things appear in wargames but rarely in real life. Uncertainty is the DM's friend. Going to beat an old drum. I hate grids. It lets players know too much. I provide players with move/fire sticks. They have to declare movement/fire before putting the stick on the table. If in a cavern/dungeon I do whatever I can to hide the grid. Junk on the floor, anything. I like it. It is simple but elegant looking. It's a gridless game, where movement is measured with a ruler or tape measure. Creatures enter melee when they come into base contact. If you come with in 1 inch of a hostile figure, it can snap to you and stop your movement to initiate combat. Nice settings. You were able to keep the play area busy, but not too crowded, which makes for easier gaming. One question for you, how do you control movement (unless there is a real faint grid on that mat?). So many dramatic situations can occur when either the PC's of the mob can either just reach the target or comes up short. 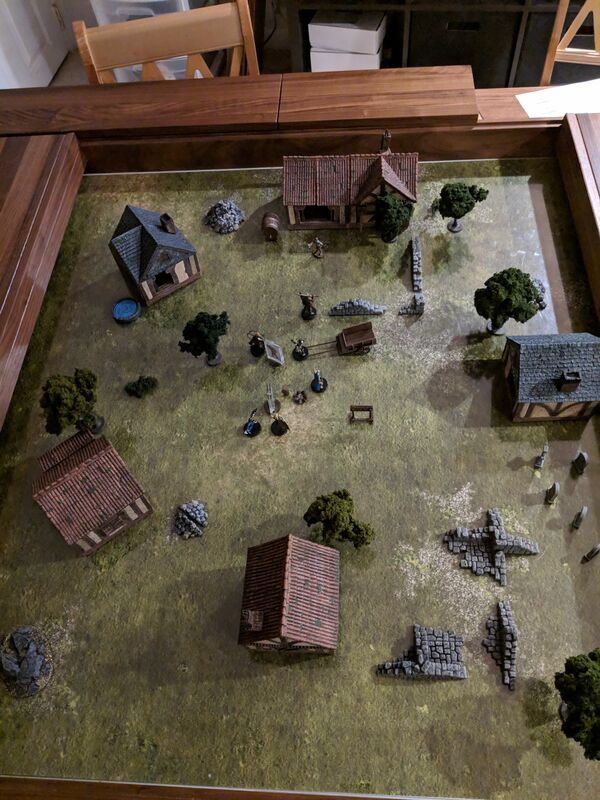 My group has begun playing Rangers of Shadow Deep, the new co-op game from the creator of Frostgrave. The pictures below are my setups for the first two scenarios. Nothing too spectacular, but the upcoming scenarios promise to be more DF-centric, so I figured I'd start a topic in anticipation of those builds. Determining that the zombies were created by a certain type of spider whose venom animates its dead victims, the rangers track the spiders back to their nests in the second scenario (the Infected Trees). 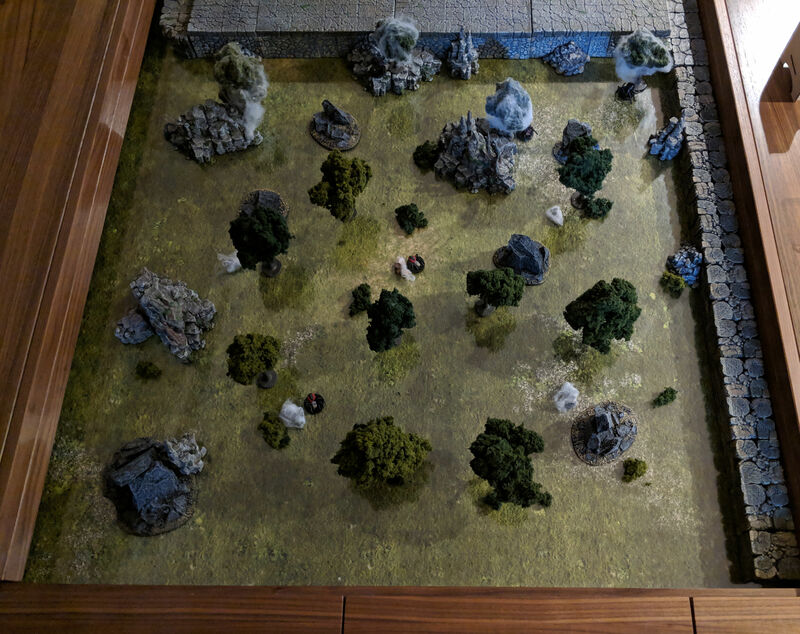 This setup doesn't use much DF, other than the mountain and cavern elevations that I used to shrink the table down to its designated size. In the photo (which I now realize is too dark), the rangers have not arrived on the scene yet.